Your wedding day is the perfect opportunity to shower your cherished partner-to-be with unique wedding quotes that fit your personality and style. Whether your sense of humor is silly or you prefer the sweet and sentimental type, you can browse this list of extensive quotes to infuse your day with love and happiness. The best romantic quotes about love and marriage can be used anywhere you want to make a statement from speeches to the décor. Try adding a message full of romance to your invitations for a memorable take on what makes your day special, or you can set them on place cards to spark conversation during the reception. Even if you don’t put them on display, they can still give you a fun way to remember all the reasons why you and your partner are saying your vows-just remember to keep some tissues nearby in case one hits close to home. Celebrate your love by sharing these quotes in your ceremony to make a public proclamation of all you feel in your heart. Whether you need the sweetest sentiment for a tear-inducing toast, or you just want to add the finishing touch to your program, you’ll find it all right here. 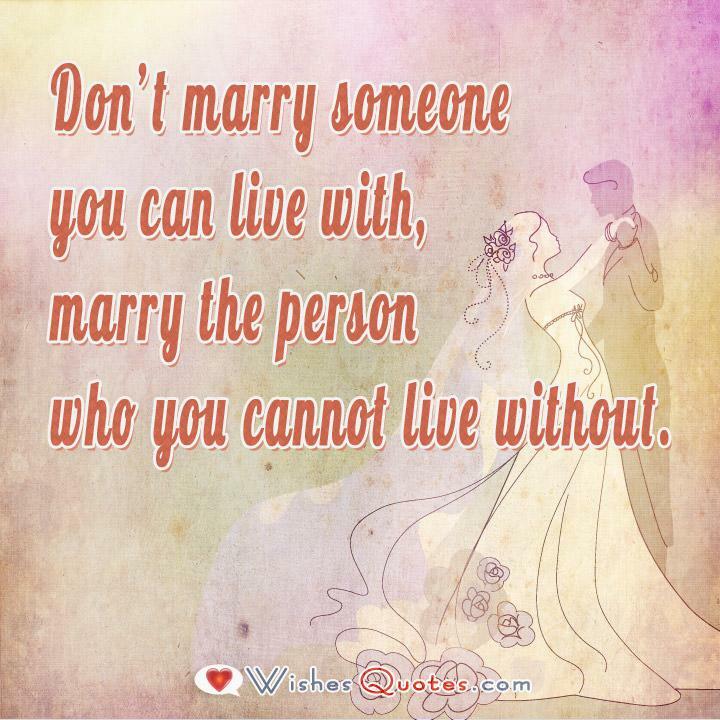 Don’t marry someone you can live with – marry the person who you cannot live without. The happiest marriages are like the longest conversations that always seem to be too short. There is no such thing as a perfect husband, wife or marriage, but the one that I have is perfect for me. If you want to know where your heart is, then just look next to you when you wake up each morning. It is all of the little things that made me fall in love with you, and it’s those same little things that will keep me in love with you forever. If he makes you laugh, kisses your forehead, says he’s sorry, makes an effort, holds your hand, works hard, attempts to understand you… then believe it or not, he’s quite perfect. Time is wasted on searching for the perfect lover, when all it takes it finding a way to create the perfect love. New love shines the brightest, and long love feels amazing, but keeping the spark alive is what warms your heart. A home is only as warm as the hearts of those who reside within the walls. I look forward to filling ours with beautiful memories. Love as if there is no tomorrow. Then, do it all over again when you wake up to a brand new day. Love becomes special because of the effort you put into it. If our love becomes tarnished, weak or broken, I will never stop working to keep it alive. Marriage means that what it is important to you becomes important to me. I cherish the opportunity to grow together. No one can measure how much love the heart can hold, but I am certain that my love for you would break the scales. It is not these rings that hold us together, nor a ball and chain. Instead it is little threads woven together that will continue to form as we love through the years. There may be other paths for couples that are easier than marriage, but what good has ever come from easy? I vow to honor our love with honest effort. I know neither of us is perfect, and that’s okay because I know that our love has the potential to outshine any of our imperfections. Finding you was like finding the secret to happiness. Our love is the key that will unlock any door that stands between our joy. When I first fell in love, it was with the person I thought you were. Now, I love the person I know, but I look forward to loving the person you become in the future, too. Love is a gift that should be bestowed freely and from the heart. We love each other not because we want to be loved, but because we love to love. Marriage is like simple arithmetic. One plus one equals two, but two minus one equals nothing. Together, we are united in love. Who knew that I would find someone willing to love me for no reason, yet show me a million reasons why they do? Let’s keep making reasons to love each other. A great marriage means being loved for who you are. An exceptional marriage means inspiring each other beyond greatness. Let’s do this! The most successful marriages require falling in love over and over again, but always with the same person. On our special day, your lifelong friendship is the sweetest gift I can receive. You are so much more to me than just a simple love. Today, I make a commitment to do everything from this point forward with the love of you in mind. Our love is not what makes my world go round. Instead, it is your love that makes every challenge seem worth the while. The day I found you is the day my life began. Today, as we blend our lives into one, there is no one else I’d rather embark on this journey with together. I’ve never believed that only fools fall in love. Avoiding love seems foolish to me, especially when there is someone as perfect as you in the world. It’s funny how you can meet thousands of people, yet none of them touch your heart. Then, you meet one special person, and your whole world lights up. May our love be full of fiery passion that warms our souls in even the coldest circumstances. You spend your whole life searching for happiness. Then, one day you discover a partner who has showed up to share the search while bringing true joy in love.